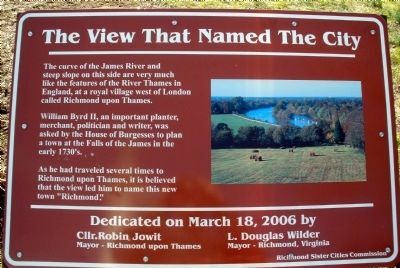 The curve of the James River and steep slope on this side of are very much like the features of the River Thames in England, at a royal village west of London called Richmond upon Thames. William Byrd II, an important planter, merchant, politician and writer, was asked by the House of Burgesses to plan a town at the Falls of the James in the early 1730’s. Erected 2006 by Richmond Sister Cities Commission. Location. 37° 31.611′ N, 77° 25.056′ W. Marker is in Richmond, Virginia. Marker is at the intersection of North 29th Street and Libby Terrace, on the right when traveling south on North 29th Street. Touch for map. Marker is in this post office area: Richmond VA 23223, United States of America. Touch for directions.
. Confederate Soldiers & Sailors Monument (within shouting distance of this marker); "Richmond" (within shouting distance of this marker); The Navy Yard of the Confederate States (approx. 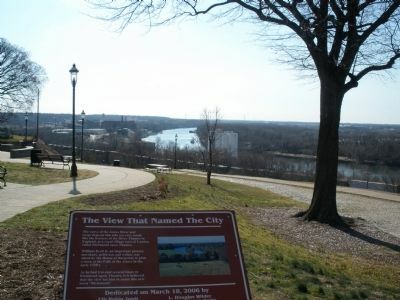 0.2 miles away); Rocketts Landing (approx. 0.2 miles away); Great Ship Lock (approx. 0.2 miles away); a different marker also named Great Ship Lock (approx. 0.2 miles away); Confederate Navy Yard (approx. 0.2 miles away); Coffer Dams (approx. 0.2 miles away). Touch for a list and map of all markers in Richmond. More. Search the internet for The View That Named The City. Credits. This page was last revised on June 16, 2016. This page originally submitted on February 15, 2009, by Bernard Fisher of Mechanicsville, Virginia. This page has been viewed 1,424 times since then and 5 times this year. Photos: 1, 2. submitted on February 15, 2009, by Bernard Fisher of Mechanicsville, Virginia. • Kevin W. was the editor who published this page.